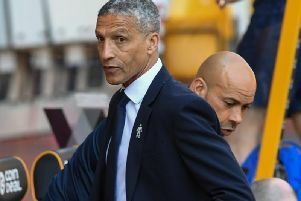 Brighton and Hove Albion manager Chris Hughton said he needs all his players 'pushing as hard as possible' for them to avoid a Premier League relegation scrap. Albion progressed to the FA Cup quarter-final with a 2-1 win over Derby yesterday, but they sit just three points above the relegation zone in the league. Hughton said: "Hopefully some of this momentum can take us through a difficult part of the season and we need to start picking up some more points. "It's our aim. We haven't been that bad in the performances we just haven't picked up points in the last few games. "The momentum of a cup run can push us up." Anthony Knockaert was particularly impressive in Brighton's FA Cup win this weekend, displaying the type of form which saw him named Championship player of the year two seasons ago, but he has so far struggled to replicate that in the Premier League. Hughton said: “I thought he was good. It was a very good goal (to open the scoring). I am really pleased with his performance. "There has never been any question marks about how we see Anthony. It is a very competitive squad and he is always in and around. “There is always frustration when you’re not playing the amount of games that you would like and I would not expect any different. "He’s been a very good team member in the group. He’s been here long enough that he knows how we play. “It’s not a criticism that we would have of him but it is a tougher league. When you’re a wide player, you come up against better defences and better full backs. It is about the part that you can play in the game and the decisions." Hughton said if Brighton are to survive, they need everyone playing at their best. “In the position we are with the points we need, we need everyone pushing as hard as possible," he warned. "That means the best thing for me is to have as many tough decisions as possible."